Sinn has complemented the historic design in the new 856 B-Uhr Limited Edition by combining the traditional look of a B-Uhr watch with the size and features that meet today's standards. As is customary with traditional B-Uhr watches, the hour hand of the 856 B-Uhr has been reduced and points to a separate, inner hour circle, while the dominant minute hand indicates the minutes around the circumference of the dial. The numerals, indices, triangular main marker and the minute hand are highlighted by ivory-colored SuperLuminova. The ordering of hour hand and minute hand on the black dial follows historical specifications: during operations, minutes were the more important unit of time, and it was important to be able to read them quickly and accurately. This watch is fully Tegimented, and has a hardness of 1,200 Vickers which is up to five times harder than standard steel. 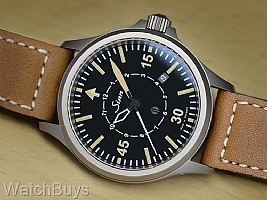 This watch is fitted with a Sinn Bund-style brown leather strap with tang buckle. Note that the large central section of the strap shown in the first picture above (the Bund pad) may be removed for those preferring a more traditional look as shown in the second picture. This watch is water resistant to 200 meters. "856 B-Uhr - Perfect Tool Watch"
Verified Owner Comments: I was looking for an everyday automatic tool watch that was 36-40 mm, under 12mm, easy to read, anti-magnetic, shock resistant, and scratch resistant. Easy combo right? This was honestly one of the only ones I could find that was less than $3000. I found myself mostly cross shopping this, the rolex explorer, the tudor ranger/blackbay, and the Sinn 856 UTC. At the end of the day Sinn provides a much better value than the tudor/rolex lines, and I much preferred the simple aesthetics of the B-Uhr vs the UTC. My only complaint is that the limited edition strap, while nice, is too long, so I purchased a black nato nylon strap to complete the package. I love it. Verified Owner Comments: Beautiful Watch. Bund pad is unnecessary which makes strap too long for my 7 wrist. Other than that small issue, this is a Beautiful Watch.